To reach the cemetery from Florence, Alabama, travel west on Alabama Hwy. 20. Turn left onto County Road 14 and travel approximately 22 miles. Turn right onto County Road 1 just before crossing the bridge into Waterloo. Travel north on Co. Rd. 1 for 3.4 miles. Turn left onto County Road 90 and go .4 mile. The cemetery is on the right side of the road at the intersection of County Road 90 & Man Bone Rd. It lies diagonally across from the Ford’s Mill Free Will Baptist Church. No services are being held at this church and haven’t been for years. The cemetery has one unidentified grave and appears to be that of a child. This cemetery was established in 1932. It is well taken care of. 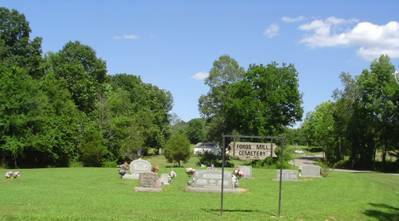 The Ford’s Mill Cemetery is located on County Road 90 in western Lauderdale County.